I have the honour to present here one of the rarest Panini collections. Campeonato Ecuatoriano de Futbol 2012 includes the 12 clubs of Primera Division and celebrates 55 years of history of the competition. The album is high quality, with brilliant design and thick paper for all the pages. The first page describes how to read the stickers of the album and includes the first shining sticker: the Panini logo "Una pasion que se pega!". Before showing the clubs of the league there are some special sections in the album. The first is one page about the national football federation of Ecuador. Here we find 5 stickers: the federation logo, the president (Chiriboga), the vice-president (Villacis), the house of the National Team, and the head office. Then there is one page with the history of the championship of Ecuador (no stickers) and one page with the 8 clubs that won the championship (8 stickers): Barcelona SC, El Nacional, Emelec, LDU Quito, SD Quito, Cuenca, Everest, and Olmedo. The top scorers of the history of the competition are represented with 10 stickers. Best scorer of all times is Ermen Benitez with 191 goals. The roll of honour of the competition is shown in one page, together with the Trophy of the league 2011 (2 stickers). The records of the championship are included with 21 stickers on three pages. The last section before the clubs is a wonderful double page with all the stadiums of the league: 10 stickers from the Estadio Monumental of Barcelona SC to the Estadio Ruminahui of Independiente José Teràn. 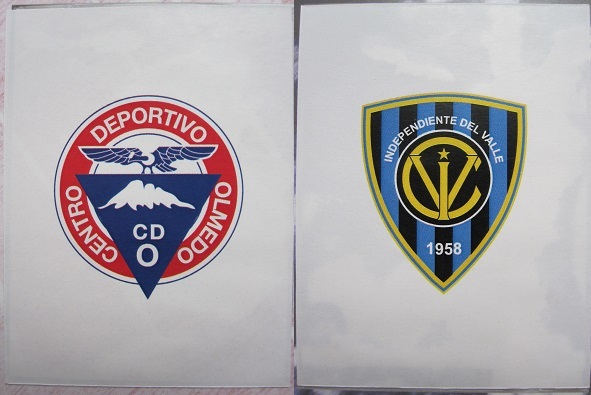 Each club of Primera Division is displaced over two pages with a total of 18 stickers: the club badge, the team photo (2 stickers), and 15 players. The Second Division clubs are included with 12 stickers of the club badges displaced on two pages. The last sections of the album are about the two best Ecuatorian scorer in continental tournaments (2 stickers of Alberto Spencer and Otilino Tenorio), the players that represented Ecuador in the World Cup (26 stickers, among them Ivan Kaviedes and Antonio Valencia), National teams of Ecuador qualified in the past for world cup tournaments (7 stickers), and the Ecuador selection for the World Cup Brazil 2014 (team photo composed by four stickers).